Please join us on Friday evening at 8:00 PM as we present a special Concert event dedicated to Let America Vote! hosted by Lawrence Neals & Tina Barro. 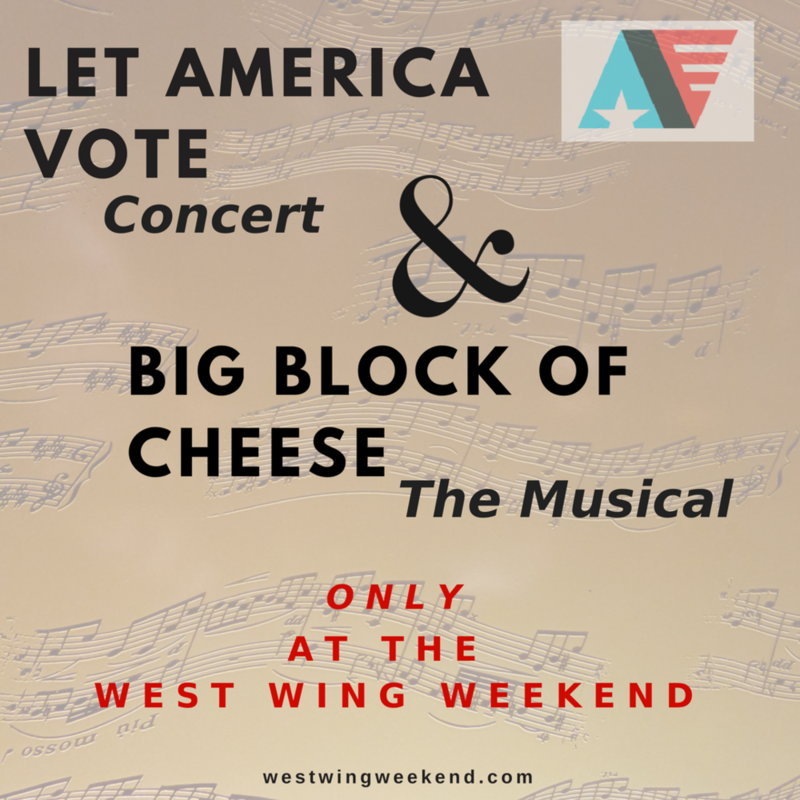 Including performances from: Steph Anderson & The Two Bartlets, Miss Nerdstiles, and the an original musical based on the "Big Block of Cheese" episodes of the West Wing. Please join us on Saturday at 8:00 PM, immediately following the State Dinner, for an amazing (black tie encouraged, but not required) Presidential Ball. The Ball will include a dance and a dessert reception. Please join us on Sunday at 3:00 PM for a staged presentation of the opening episode of Season 3, Isaac & Ishmael. Our staging will be adapted and directed by Natalie Parks, a George Washington University student who has adapted and presented Isaac & Ishmael to great acclaim. We are also excited to offer the following Special Event Programs that are only available with an additional ticket or a VIP pass. Join us on Saturday, September 29th at 6:00 PM for an elegant State Dinner. This special dinner with our guests will only be available to those with a ticket to the Weekend who also purchase the State Dinner, or who have one of our VIP passes. Tickets to the State Dinner are $50 and include a plated meal. Join us on Sunday, September 30th at Noon for our Keynote Presentation and Luncheon. This special presentation will only be available to those with a ticket to the Weekend who also purchase the luncheon ticket, or who have one of our VIP passes. Tickets to the Keynote Luncheon are $30 and include a hot catered lunch.